Heading home from Tigard on Saturday afternoon, Aug. 26. 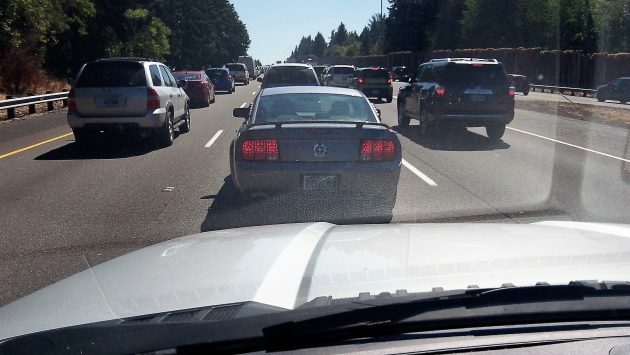 When you’re stuck in traffic, whether it’s stop-and-go on I-5 south of Portland or waiting through two cycles of a light on Ninth in Albany, you get the impression that Oregon just has way too many people. Or people with cars, anyway. That impression is reinforced when you look at the tables published by the Population Research Center at Portland State. For example, Oregon had about 1,980,000 residents in 1967. That’s when, as a young man, I moved from Los Angeles to Ashland, so I obviously bear part of the blame for the influx that year of an estimated 20,300 people from out of state. Migration from outside of Oregon has been the main driver in the state’s population growth to 4,076,350 in 2016. Except for three years during the Great Recession (2009-11) the influx has outpaced natural population growth — the excess of births over deaths — every year since 1966. Governor McCall famously tried to stem the flow in the 1970s, urging people to visit again and again but not, for heaven’s sake, to move here for good. It didn’t work, obviously, and may have had the opposite effect. Migration to Oregon climbed sharply in 1973 and then reached more than 50,000 in 1978, a number not reached again until 1991, 1993 and, ominously, last year when more than 52,000 newcomers showed up. Not much can be done about this, no matter how longingly we may remember the days when getting around on Oregon’s excellent and largely empty highways was one of the simple joys of life in this state. Building more highways is not the answer, partly because it’s not feasible in thickly populated areas and partly because it’s way too expensive and time-consuming. Just adding lanes to I-5 near Albany has been in the talking and planning stages since the 1990s and is nowhere on the horizon of getting done. What we might do instead is to stop adding huge traffic magnets in places where they can’t help but increase congestion. But that would presuppose getting rid of zoning of the kind that prohibits commerce inside areas where people live and work. Bravo! Thank you, Hasso, for brightening my day. Every car on the road has someone in it who is going somewhere that benefits them. Adding road capacity that increases the number of cars means more people are getting to do more things that benefit them. So, increasing capacity generates increased benefits (ex: economic) that wouldn’t have happened otherwise. New travel generates economic benefits, so people who make the “induced demand” argument are actually saying that new roads create economic benefits. Walking and bike riding are great if you are able, but ineffective when a person shops for a new Jag in Portland. By comparison, hopping in an old, crappy Saab and putting up with some congestion on I-5 is a small price to pay for the benefit received from the trip. Congestion-pricing may be one possible solution. And given that vehicle-mileage fees are a form of road pricing, I assume it to be a solution that would attract you. Vehicle-mileage fees? Not so happy with them unless they take account of road wear vs vehicle weight, etc. Also, they don’t provide any incentive to avoid the most congested times and routes. So do floods and fires. When has government ever solved a social problem through regulation? Granted, some reasonable zoning is appropriate, but proposing that it can solve a problem of this magnitude is flirting with deadly consequences. I would like to see truck license fee triple once they are causing more road damage and pollution than a regular car. Those huge trucks take 2 parking spaces in most lots and cause more trouble with extended front bumpers and hitches on the back. I have seen people get hurt walking into hitches on the back in a dark parking lot. At least require they have glow in the dark paint! Oregon license fees are too cheap, really!